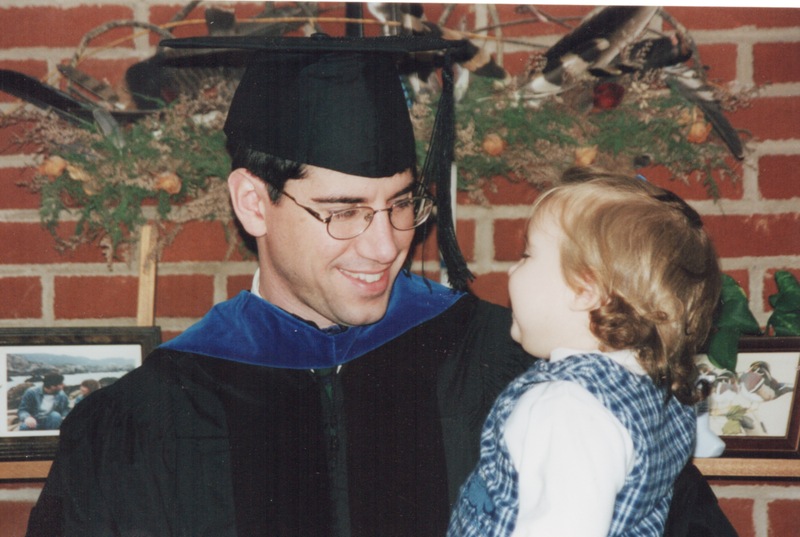 One of my most cherished duties as a university professor is to take part in Commencement each December and May. It’s a chance for students and their families to celebrate accomplishment and new beginnings, and I always enjoy meeting families of the students I have in some cases come to know quite well. For their part, the students and their families get the added treat of watching a parade of my colleagues and I wearing colorful dresses from the Middle Ages. 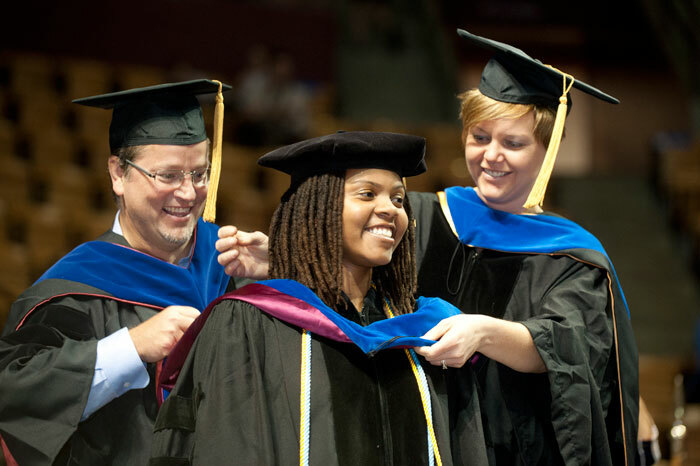 For newly-minted PhDs, a key event at Commencement is the “hooding”ceremony. As with most wickedly pedantic things in life, just about every detail in the silly garb we professors don for Commencement has some particular meaning. This includes the heavy velvet robes and hoods themselves, thought to hearken to a time when seats of higher learning were exclusively in big, drafty stone buildings without central heating. For those holding the doctoral degree, typical academic regalia includes a robe with big, puffy sleeves that feature three velvet bars, and two additional strips of velvet in the front flanking the zipper. Usually the background fabric and velvet are black, but to be extra fancy many robes these days have the velvet trimmed with bright piping, often gold. Also, many people wear officially sanctioned designs of the university that conferred their degree, and these are often rendered in school colors. 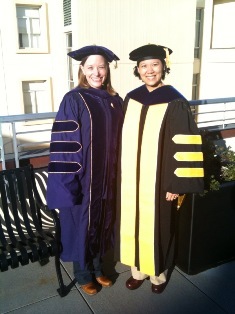 Official PhD regalia from the University of Washington (left) and the University of Iowa (right). In addition to the robes, most faculty will wear puffy velvet caps with 4, 6, or 8 sides and usually with a gold tassel. Finally, we button ourselves into complex contraptions that are supposed to be the hoods, but they really only function as colored insignia to be seen from behind. Modern hoods have velvet trim (a dark royal blue is used for most disciplines to designate a PhD) and bright satin panels on the inside that are displayed to the outside. If you’re not wearing official robes of your conferring institution, then it’s the school colors displayed on the hood that identify that institution. That’s right, for the lame professors like me out there, our current institutions keep basic regalia on hand for us to rent. 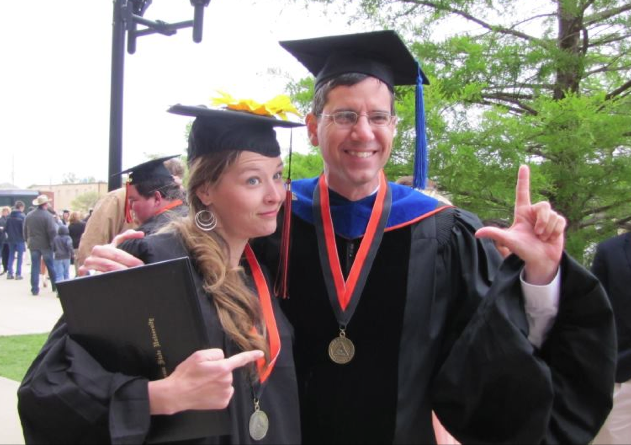 This serves the basic purpose, but it’s a big hassle to go and rent it a couple of times a year, the items get kind of threadbare after a while, the mortar board makes me look like an undergrad, and worst of all, the hood suggests that I obtained my PhD from Oklahoma State. I’m not trying to be a snob, I just want to be accurate, so I’ve been in the market for a basic set of professor’s kit that will show my Penn State heritage without breaking the bank. To be clear, our friends at Jostens can outfit you with this sweet design. If it’s in your means to get one, go for it! There are lots of places that will make a custom hood for your academic dress. These guys can outfit me for less than 300 bucks, and I’ve decided that I would be willing to spend that much on this stuff. There’s just one problem: using the best of my Google Fu, I’ve been unable to find a photo of someone wearing the Penn State PhD hood, photographed from behind. Seriously, I’ve been all over this and have searched many times. The key information I need to order my own hood is where to put the blue and where to put the white in the satin panels of my hood. I didn’t want to guess and be wrong; I actually wanted to see one. They don’t exist. Obligatory photo with my faculty advisor and dear friend Rob, who also apparently just wore a Penn State robe off the rack! I had to pose with my baby girl! And then, joy of joys, there it was: WE were smart enough to get at least one photo from behind! Now I know where to order the white and where to order the blue! So there you have it, Google: Right here is the only photo on the Internets of a PhD hood from Penn State! You’re welcome. Now we’ll see if I can get my act together and actually order this thing in time for Commencement . . .
Edit – For those looking to order from Grad Shop.com, here’s a screencap of exactly where to put the blue and the white. Congratulations on needing to do this! We Are . . . Penn State! 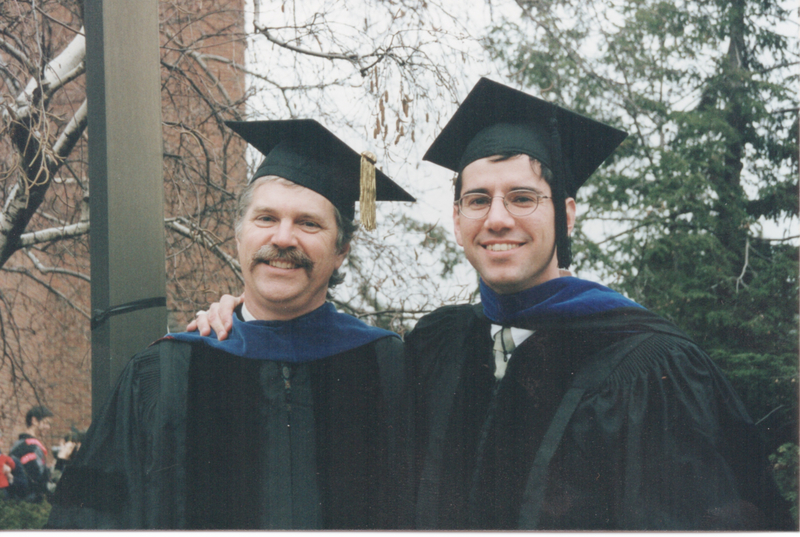 This entry was posted in life and tagged Penn State academic regalia, Penn State PhD hood. Bookmark the permalink. I ran across this post while trying to find a lower cost alternative to the PSU doctoral regalia. 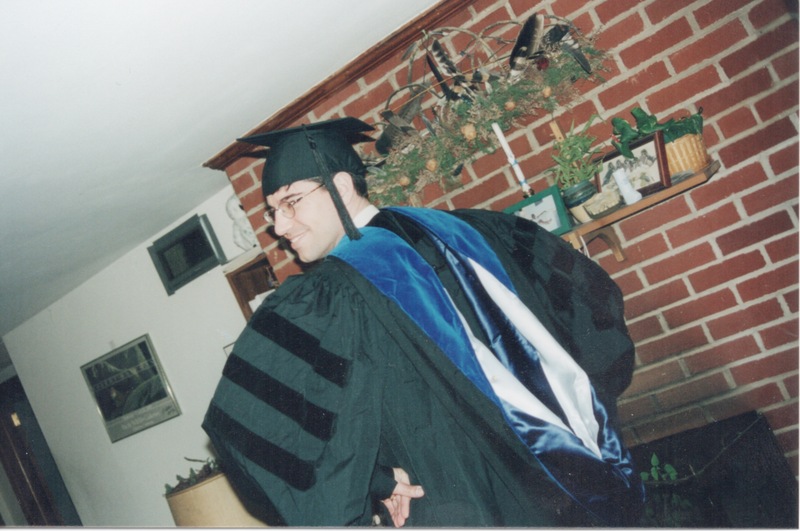 I’m in a similar situation… I got my PhD at Penn state and now on faculty at another institution and dislike my cheap garb at graduation, but am unwilling to spend $800. Please let me know if you were happy with the vendor you found. Did they put the nittany lion on front, or was it just a blue gown? Thanks!!!! Hi Liz – I’m glad you found the post. I was pretty sure I wasn’t the only person out there with this problem! I ended up ordering from http://www.gradshop.com/academic-regalia/doctoral/gown-hood-packages and yes, I’m happy with the purchase. It’s not top-of-the-line quality, but it looks great for < $300. The gown is basic black with 3 sleeve chevrons (like my old photo in the post), so there's no Nittany Lion anywhere or any other insignia that specifically identifies Penn State. The key was the pattern of blue and white in the hood, and the custom hood I got beautifully matches the hood in my old photo above. The nice tam with the gold tassel really spruces up the look too. So I was happy ordering a custom facsimile of Penn State regalia. You can customize at gradshop.com even more than I did (e.g., gold piping on the sleeves), but you can't really get the same official fancy-pants regalia by going this route. Good luck – let me know how it goes for you! Update 15 August 2014 – Today I get to don the regalia for a welcoming convocation of incoming freshmen. It was so nice not to go through the hassle of wandering over to the Student Union to rent one during the week when all the students and their parents are packed into that place. Ha ha – happy to help! Good luck getting the right match to your colors. I’m still very happy with that purchase and looking forward to donning it again in a few weeks. As a Penn State PhD grad I’ve been looking for cheaper alternatives too. But I still want a blue robe, and it looks like this site only offers black. Also everyone should know that you can buy the official regalia in pieces. I wore a recent graduate’s regalia to my graduation, but his tam was too big, so I bought just the tam for myself. This means you can also buy just the hood, and you don’t need to have one custom made to match. The robe itself is the really expensive part, so you could get that cheap and still use the real Penn State hood. GREAT question. I have edited the original post with a screencap from my order so you can see exactly how to get the colors in the right place. Good luck . . . and congratulations! Same boat here. $750 is pretty egregious for something you only wear once or twice a year. On the other hand, rending is a huge hassle. My solution was to buy the official PSU hood from Jostens and then I bought a deluxe black robe and tam with gold piping from GraduationMall via amazon for way less than the full setup at Jostens. Not as good as the official PSU getup, but pretty good and better than some super discount sources that, for example, don’t feature piping. I was quite tempted to get the official tam for not much extra money. It would have matched the hood but not the robe, though, so I passed on it. Thanks for posting this! I know it’s a few years old now but it was helpful. Particularly because you wore the black regalia. I wasn’t sure I’d make the deadline for submitting (and thus participating in the ceremony) so I held off on buying anything until I knew I’d be able to participate. However, this made it so I missed the deadline for ordering (feel like it’s obsurd to have a dissertation submission deadline that’s weeks after the deadline for ordering regalia). Now I was worried I’d be the odd man out wearing the rental regalia, which is all black and not in the school colors (which is also weird…). Were there a lot of black regalia wearers at your ceremony or did you feel the blue penn State robes were the majority? This post is the gift that keeps on giving……as the doting parent of a recent PhD grad with a new academic post, I went looking for info about how to make some of the regalia. One thing to know is that there are readily available sewing patterns for the robe part (look for “choir robe” in the description). There are also tons of hat patterns that can be easily adapted for the tam. Neither the robe nor the tam should be a huge challenge to a reasonably skilled sewer. The hood……I bought one. ALSO university book stores frequently sell embroidered patches with the school insignia if you want to include something like that. Great feedback – I’m glad I posted something useful! Thanks for this post! It was super helpful. I’m at the University of Pittsburgh and planning to order as you’ve described above in-line with my PSU PhD degree. Question – what about the cap/tassel?